The dome site is peculiar in that the entire site had to be built from so called ecologically friendly or green materials. This meant that none of the buildings could use PVC in their construction, to the extent that the designers considered avoiding the use of electrical wire with a PVC coating insulator. A five layered, 64-ton inner liner was produced, achieving an overall reduction in sound of Rw 32dB, whilst limiting fire propagation to a high standard. The outer roof consists of a specially commissioned, duel coloured, PTFE coated glass cloth, and fabric liners cover the 22-meter (72 feet) high walls of the auditoria. Over eighty-six thousand square feet of material were used in the construction of this 170 feet by 390 feet building. 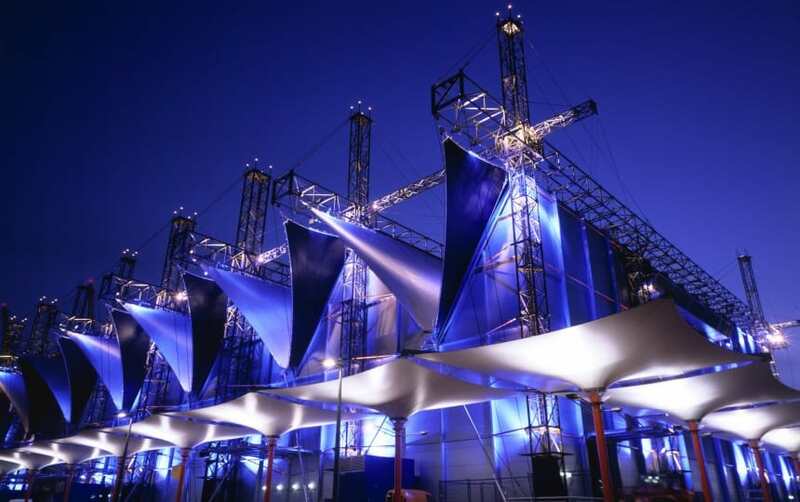 The building was completed in nine months, and is a dramatic centre stage partner to the Millennium Dome in the United Kingdoms millennium celebrations. Skyscape is two, 2,500 people auditoria, linked by a refreshment area, ticket office and other services in between. This building is the first in a new generation of permanent structures, born out of the quick build, temporary structure industry. It has span of 170 feet and an overall length of over 390 feet, built up in 50 feet modules. In the future, structures of this length can easily be increased by inclusion of additional modules, and the width can also be increased up to 230 feet. PTFE coated glass cloth was chosen for the outer roof for its durability. It has a life expectancy of around 25 years. It is also a very lightweight material, and is exceptionally strong. When combined with the correct materials it can withstand all weather conditions well. What make the buildings interesting are two novel features. Firstly the materials used on the outer roof had to be coloured silver on the outside and black on the inside. No such material existed when we started the project, and so we had to find a supplier that could carry out the necessary research and development in to the manufacture of this material. After checking with and receiving samples from major fabric manufacturers, we decided to use a material supplied by Taconic International. The material they developed had a bright silver finish on the outside, with an almost matt black finish on the underside. Of all the samples received, this was far and away the best finish obtained. Taconic were very experienced in the manufacture of the PTFE coated glass cloth, but nobody had hitherto successfully managed to product this material with dual coasting. They overcame this obstacle by using the kiss-coating technique. This involves passing the 2m wide fabric panels through a series of rollers under tension. When there is a slight lessening of tension between the rollers, the fabric sags just enough to kiss the surface of a bath containing the pigmented PTFE coating material. Taconic claims that this technique allows a fabric with a different colour on each side to be produced for the first time ever. Inner liner. The second interesting feature of the building was the sound reduction levels required. Top stop both local residents in Greenwich and occupants of the Dome being disturbed, the local council insisted that a reduction in the sound of Rw 30dB was achieved (Rw is approximately equivalent to STC) which is about the same level of reduction as 50mm or 2 inches of solid timber would give. We were asked to produce and inner liner to the roof of the building so that this could be accomplished. This lining had to follow the contoured shape of the external roof and act in sympathy with the external tensile structure. We had to manufacture this from a material that would not contribute at all to the propagation of a fire and the material used had to be something other than PVC. We found that there was no suitable product on the market ready to use, so we spent a considerable time looking for the correct materials with which to make this liner. In the end we found a supplier who specialised in the production of noise control solutions and produced sound absorbent parcel shelves and panels for cars, tractors, motorcycles and military vehicles. They also worked on cinemas, but we found that the materials used there were not flexible or strong enough to be suspended over a length of up to 13 meters or 42 feet. Acoustics is a very black art indeed. Sound is a medium not dissimilar to water in the way it can disperse. A gap the size of a keyhole will allow the sound to escape from the building. This course meant that the sealing around suspension brackets and connection details had to be very through, and considered with care. 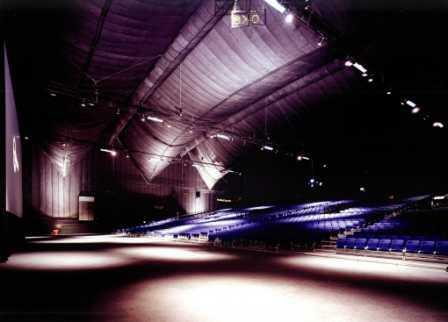 In a typical fabric structure there is a high level of reverberation produced within the building envelop. This means that when you make a loud sound, you can hear it for a number of seconds after the sound had been made. In a live concert where load noises are produced continually, the reverberation causes the noise level to build up within the auditorium and ruin the performance. To limit this phenomenon, the liner inner layer was designed to reduce the reverberation time within the auditoria: hence sound will die at a much faster rate than previously. For this layer we required a material that would fold without creasing, be easy to work with, readily available, cheap, non-PVC and still conform to the highest flame retardency specification. Spun polyesters were tried but found to be of poor resistance to burning. Another material, called Melatech was looked at, but we found that is would break up when folded. We also investigated using mineral wool glass cloth, as it satisfied all of our requirements as discussed earlier. We eventually decided to use Rockwool or glass wool. This is the same type of material that one would find in house insulation. Despite the very unfriendly nature of this material to the skin we felt this was the best option, as it satisfied all of out requirements as discussed earlier. For the surface finish of this inner layer we needed a matt black finish for which we used a material called E Glass. This is a silicone coated woven glass fabric. This was supplied as a standard finish and suited our needs perfectly. The only problem was that is was glass fabric, and because it only had a small amount of surface coating, was very brittle. Great care had therefore to be taken with the construction, design and material handling during installation. Another problem with the glass fabric facing relates to the differential of stretch characteristics. When put together with the base polymeric fabric under load the base fabric will stretch two or three times more than the glass. This gives a significant risk of failure of the glass cloth. We how ever overcame this problem by the introduction of quilting. Because the Rock wool compressed during sewing, it effectively caused extra glass to be sewn in to the structure, giving sufficient extra length to compensate for the difference in stretch. This theory was tested by putting a one metre wide section under tension and stretching it with hydraulic ram until we reached a load of 1.5tons. This was far in excess of the expected load, and well within the capability of the fabric. The main sound-insulating element of the liner is the central layer, a floppy barrier with high damping and low stiffness properties. The heavier this element of the liner is, the greater the overall sound insulating quality of the liner. But because the liner needs to be suspended within the structure, the material needs to be as light as possible. We needed to achieve the optimum performance for a specified maximum mass. Several variants came close to being suitable for this central layer, the most promising being lead based. It was found that lead sheeting had the great advantage of being sewable, and we could have used mechanical fixings such as staples or rivets to hold it together. But unfortunately lead has a memory and we feared that once it was folded and stacked it would not hang properly, giving creases, and thereafter a poor finish inside this prestigious structure. Sand was a potentially cheap alternative for the central layer, but would have required a very difficult type of construction. High frequency welding and sand is a bad combination: not only will it cause arching out of the welding machine when in contact with the welding process but it is also a very messy and labour intensive material. Had we used sand, it would have required a construction from based on rows of tubes with sand and sewn together side by side. This could have left gaps between the tubes that would have allowed sound to escape. After further research we identified a material known as polymeric Mass Layer this is made from waste materials and chalk, and has a rubbery type construction with some resistance to tearing. It also had sufficient tensile strength to work in this environment. We were initially concerned about the materials high degree of elasticity : however, tests proved that it was able to hold its own weight over the length we required, and with an adequate safety margin. A suitable material had been found: Polymeric mass layer would not crack, it folded without memory, had good resistance to burning, and was not made from PVC. Finally, the outer layer of the liner helps control the resonance of the void between the inner and outer layers of the structure. This helps the overall effectiveness of the liner by reducing the build up of noise outside the liner reducing the build up of noise within the structure. With this newly designed, layered fabric construction, we had five layers of fabric to join together and to manufacture into a reasonably tensile structure. Construction: the construction was twofold; we used a laminating process to glue the mineral wool to the mass layer and to the tissue; the whole was then sewn into a quilted finish giving the appearance of a giant puffa jacket. FTL Happold, based in New York carried out the pattering, we supplied the fabric and designed the supporting steel work, and our supplier carried out the manufacture of the quilted layer. They used a team of 30 people, set up in a temporary production line and manufactured the 64 tonnes of fabric in approximately 8 weeks. The noise control centre performed testing of the liner on 29 March 1999 in accordance with current British standards (BS EN ISO 717-1: 1997) The test panel was erected in an aperture of approximately 9 square metres between two reverberant chambers, which were constructed to suppress the transmission of sound by flanking paths. As the test specimen was smaller than the test aperture, the specimen was installed within purpose built highly insulating infill partition (figure 4) Both chambers were irregularly shaped and contained several reflecting diffuser panels to improve the diffusion of the sound fields. A steady sound source with a continuous spectrum in the frequency bands of interest was used to drive an Omni directional loud speaker, located sequentially in two positions in the source chamber. Sound level measurements were made simultaneously in both chambers at one-third octave intervals from 100Hz to 5000Hz. Measurements were made with a microphone attached to a rotating microphone boom to obtain a good average of the sound pressure levels in each chamber. Measurements were also made of the noise level in the receiving chamber in the absence of the noise source in order that corrections for background noise could be made. The weighted sound reduction index (Rw) in decibels (dB) is then calculated by comparing the sixteen values of sound reduction index from 100Hz to 3150Hz with a defined reference curve, which is incremented until the requirements of BS EN ISO 717 are met. We set out to achieve a sound reduction of Rx 30dB and after initial testing we discovered that this was accomplished. A full scale test on a 9m panel was performed at a later date, and that performance was measured at Rw 32dB. It is likely that the installed performance is even better than this. The design therefore was a success. To make sure that the panels would fit, we used the same pattering process for the liner as the external roof. A computer modal was set up by FTL, from which wind and snow loadings were calculated, and patterns were generated to suit the fabric width. These patterns were sent to us in the UK in digital form, and we then laser cut the shapes from stiff PVC to be used as templates. Because of the multi layered mature of the liner, and as a result of the physical width of the fabric we were now dealing with, the only tool we could find to cut these panels was a jig saw. This crude method did however work, and the panels were passed to the sewing machines for finishing. Liner installation: the surface area of material used was 86,000ft2 and the total weight f the lining worked out at 64 tonnes. Due to the sheer bulk of the liner, ten 40ft flat bed trucks ere requited to carry it to the site, and because of the size of each complete roof section and the eight of the fabric, each of the 16 roof panels were broken down in to 52 pieces: the smallest being approximately 3ft x 21 ft and the largest 46ft x 3ft each piece had been designed to hang from metal brackets on roof truss and then fixed along the valley using a series of metal plates. Each panel was joined together using a high grip Velcro, which was so strong that two men struggle to pull a two inch strip apart. This meant that we had to be careful during installation not to get a false fitting position. The Velcro also had the advantage of producing an excellent acoustic seal, stopping the leakage of high frequency sound. We assembled the panels together in batches of four, and hoisted them up to the roof on a scissor lift to hang them. It was simple process but very heavy work. They were installed using two teams of riggers working 12 hour shifts for almost 6 weeks. Internal walling: the walling had to look the same as the roof, but the building already had metal clad exterior walling which achieved a noise reduction of Rw 27dB. This meant that our quilting was needed to improve the acoustic performance only by a further Rw 3Db. We used a double-sided glass cloth cover the mineral wool filler and quilted the whole together. Everything was then suspended from the roof and tensioned down to the floor using tubes and ratchets. Installation of the liner took approximately 8 weeks. External roof installation. The installation of the outer roof used two teams working around the clock on site and took 12 weeks. As we had manufactured a double skin structure, live loads were now being transferred from the outer fabric membrane to the inner membrane through air pressure and vacuum. Inserting large vents at each end of the structure relived this. Nonetheless, the acoustic liner had to be strong enough to cope with a proportion of this transferred load, and tests were carried out on the fabric to ensure this was possible. Work on the whole building on site took approximately 9 months including out with a bar and ticket office as well as the two cinemas. Finished product. Acoustic consultant to the new Millennium Experience Company (NMEC), Jim Griffiths of the Symonds Group described the acoustics of the building as Absolutely stonking, which we took to mean that the design was success! We have received lots of interest on this kind of structure since Skyspaces construction, and are looking forward to the opportunity of creating more of them around the world in the future.